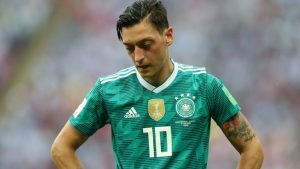 Mesut Ozil shocked the world after the German mid-fielder announced his immediate retirement from international football. The Arsenal player claimed that ‘racism and disrespect’ were the two main reasons behind this major decision. Here is the statement in full. Mesut Ozil has been massively disrespected & used by certain people for political gain. It’s disgraceful. “I am German when we win, but I am an immigrant when we lose. Racism should never, ever be accepted.” – Mesut Ozil. “I am a German when we win, but an immigrant when we lose.” – Mesut Ozil. Mesut Ozil drops the mic and walks out of the German national team. There will be plenty reading this who, based on tribal loyalties, have little respect for him as a footballer. Having read that statement of his, I’ve boundless respect for him as a man.